I just finished reading the new biography on Craig Claiborne, The Man Who Changed the Way We Eat: Craig Claiborne and the American Food Renaissance . The book is certainly an unvarnished look at Claiborne's rather turbulent life, but the sections of the book that I found most interesting were those that focused on Claiborne's passion for food and cooking. And really, that's what I want to remember most about him. The book's author wrote that upon Claiborne's first retirement from The New York Times, the food critic set out to write and publish his own Craig Claiborne Journal. That endeavor, however, was put on the back burner after Claiborne met an accomplished Chinese cook living in New York, Mrs. Virginia Lee. 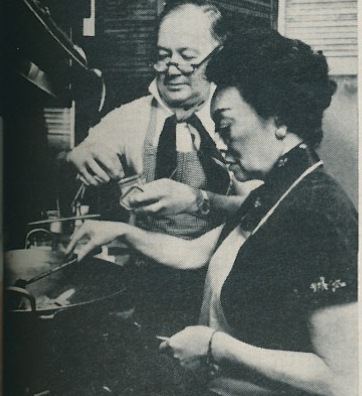 Claiborne was so taken with Mrs. Lee that not only did he take Chinese cookery classes from her, he also coauthored The Chinese Cookbook with her . 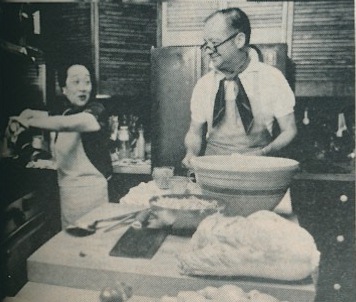 In fact, the book is still considered to be one of the definitive works on Chinese cooking. Funny enough, just a few days ago I happened to find an article on Claiborne and Lee in a 1971 issue of House & Garden. Talk about fortuitous timing. 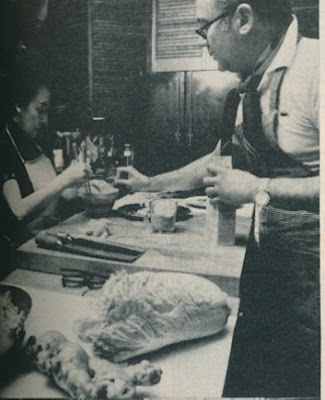 The article shows Claiborne and Lee in the kitchen (could it be Claiborne's kitchen in East Hampton?) preparing a seven dish Chinese luncheon for ten guests. 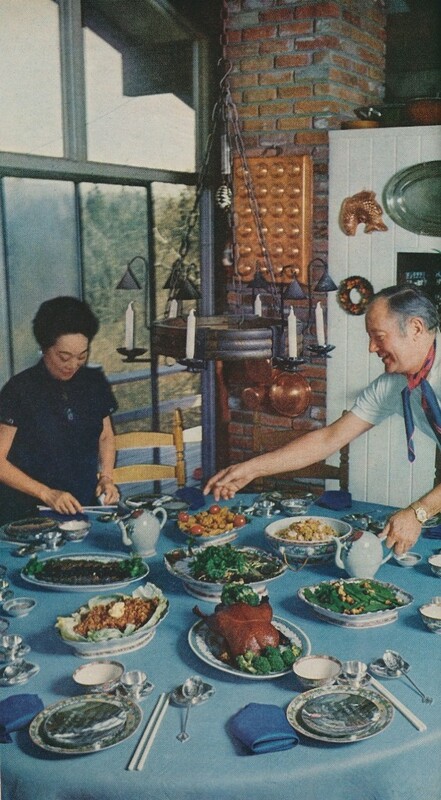 Lee noted that "The advantage of a Chinese meal is that so much can be prepared in advance and refrigerated, then just brought to room temperature before cooking quickly in a Chinese wok." The menu included Aromatic Spiced Beef, Chinese Chicken with Nuts, Snow Peas and Straw Mushrooms, Steamed Flounder, Lettuce Packages, Smoked Duck, and Best Fried Rice. Sounds like quite a feast, and a delicious one at that. And after looking at the article's photos, I think that one can really see the camaraderie between Claiborne and Lee. 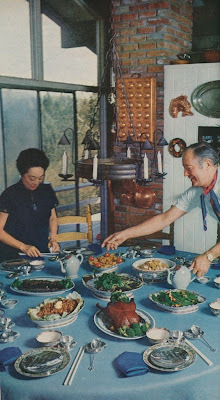 While I've never considered cooking a Chinese meal at home before, I have to say that after reading both the Claiborne biography as well as this House & Garden article, I am now inspired to try my hand at it. Not all seven dishes, mind you, but perhaps just one. No need to bite off more than I can chew. All photos from House & Garden, July 1971. Craig Claiborne's contributions to how Americans eat today cannot be overstated. The broadening of tastes towards Mexican and Cajun foods were notable as well. His newsworthy celebrity parties in the Hamptons were a long way from his start in Sunflower, MS. Classicist, You're quite right. I admire that he was self-made, too. I've already ordered this book. Glad you are enjoying it. As a bride in 1975, the girl who handled a piecrust so much it came out in one piece more suitable for a picture frame than to be eaten, I joined the American foodie revolution. I have often wondered how he would have been different in today's more acceptable climate. Always saddens me to see talent affected by fear of being one's self. Fascinating! I gave his quiche recipe a mention here: http://thehomeyoumake.blogspot.com/2012/04/brunch-recipes.html I will certainly pick up the book! Thanks for the tip! Chinese cooking is an art--but once you understand the ins and outs, not that difficult. Plus, it is so healthy if you reduce the fat content and switch to Virgin Olive Oil. Yum. Good luck. I must admit Craig's Christmas Day all meat chili is still one of my favorites.It is what he served to guests on Christmas. I go with the more traditonal holiday foods but enjoy it just the same. I'm going to have to try his quiche, his chili, and his Chinese cooking! It all sounds delicious. 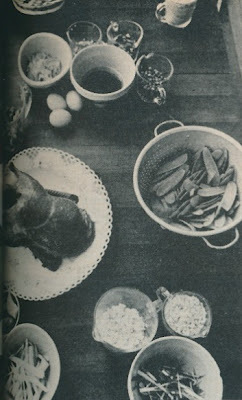 When I was a young bride in the early 1960s, Claibourne's NY Times Cookbook was my bible. I still own it along with the later 1990 version, his books with Pierre Franey and with Virginia Lee. I'll have to place my order for his biography. Thanks for writing about him. As a college sophomore back in 1970 I had the good fortune to be invited to Craig's home in Easthampton on a day when Virginia Lee was cooking; we had her famous lobster in black bean sauce and other dishes I cannot recall....wonderful time; Craig picked me up at the trainstation and drove me back to his home for a fantastic afternoon.....I'll never forget it. Robert, What a wonderful memory. Based on the book and what you've written, it sounds like Claiborne was quite hospitable. The lobster in black bean sauce sounds delicious. While I would prefer for someone else to prepare it, perhaps I'll try to find the recipe and make it myself!